THE REVIEW: Chef is a film that’s not only about food, but is also a film about a father-son relationship and how careers can sometimes get in the way of having a family. Taken from a distance, these two focal points can seem separate and not well integrated into a single story. At the beginning of the film, it certainly feels like Chef Carl Casper (Jon Favreau) lives two completely different lives: one with his son Percy (Emjay Anthony) and ex-wife Inez (Sophia Vergara), and one in the place where he feels most at home — the kitchen. While both separately make for good stories and provide something for you to gravitate towards, this dichotomy also slows the film down a tremendous amount. Instead of everything building around a central story, you have to split your attention in two paths. Looking at the overall structure of the film, it is split into two clear and defined halves: the first is Carl as head chef of the Gauloise in California and the second is him trying to rediscover this passion on a food truck in Miami. Again, each half plays great in their own right, but it makes the film feel disjointed and without purpose. Instead of feeling like a cohesive whole, it feels like two extremely well done short films put together. Despite all these criticisms, I came away at the very end of Chef throughly impressed. It gelled together in a way that I thought couldn’t have happened looking at where the film started. Casper’s developing relationship with his son feels genuine and you can see the joy and passion return to his life when he returns to the roots of what he loves to do most: cook. 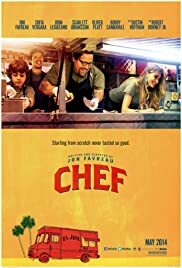 In this sense Chef is more about the journey and the journey Jon Favreau (who also wrote/directed the film) takes you on is a moving one. You don’t forget that the film was split into two parts nor that this is distracting from pure enjoyment. But you do let it slide to the back of your mind and give it a pass because Chef learns from its mistakes much like Chef Casper does in the film.